Skype is trending on Twitter in the UAE – for a reason. 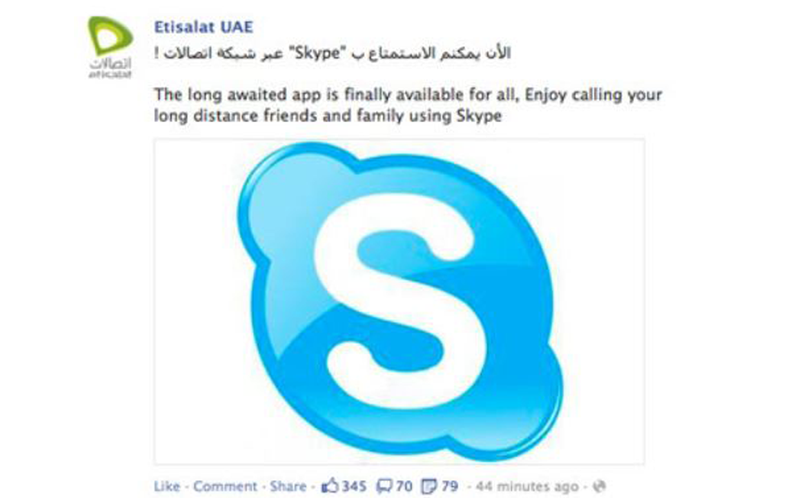 UAE telecom operator Etisalat has unblocked Skype, the VoIP calling service, in the UAE, Emirates 24|7 has learnt. Etisalat confirmed this in a tweeted response to us: "Hi, yes it's now accessible to all Etisalat users :)" one of the telecom operator's Twitter accounts (@Etisalat_Care) said in a response to our tweeted query. We were pleasantly surprised to be able to not just log on to the Skype website (www.Skype.com) but also download the Skype application without a hitch this morning. Evidently, the operator is not making a big brouhaha about the unblocking as free Internet calls through Voice Over Internet Protocol (okay, okay, VOIP) will mean some loss of revenue for the operator. Nevertheless, Etisalat did post the update on its Twitter and Facebook feeds last week, which now seem to have unceremoniously disappeared from its social media timeline. “The long awaited app is finally available for all, Enjoy calling your long distance friends & family using #Skype,” the telecoms firm said in its social media update. 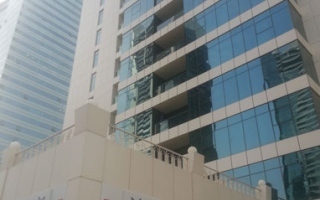 The UAE’s second telecom operator du hasn’t made any such announcements, but the Skype website is indeed readily accessible from its network too. "We'll have more info on that for you soon," was the only official reply that we could fork out from Du through its Twitter handle @dutweets. We're waiting, du. Incidentally, today, April 8, marks the day when Skype-owner Microsoft kills its Windows Live Messenger service in some parts of the world in favour of Skype. So, has the UAE finally lifted the ban on Skype – and other VOIP calling services? With no official confirmation coming in – yet – we’ll have to wait and see to get a conclusive answer. While both the UAE's telecom operators sell VoIP calling cards, they have (until now) not officially announced all-pervasive availlabiity of free calls to Internet subscribers. This, however, may change with Skype now being accessible by all in the country. 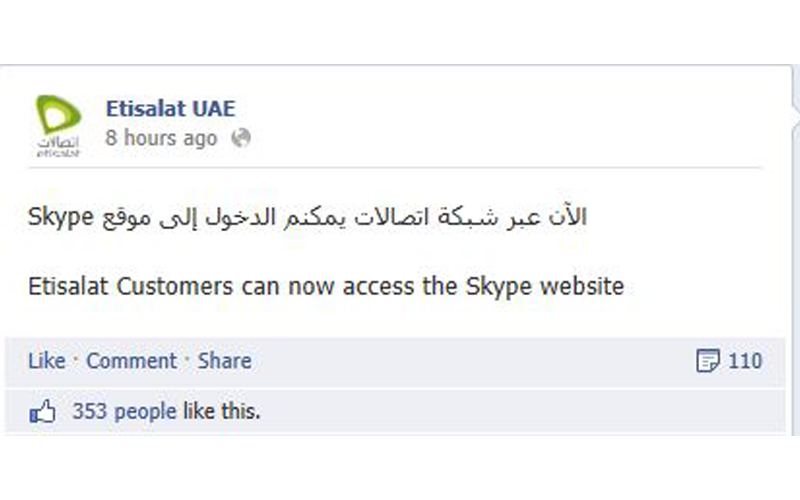 Nevertheless, it isn't the first time that a Skype 'ban' has lifted in the UAE. 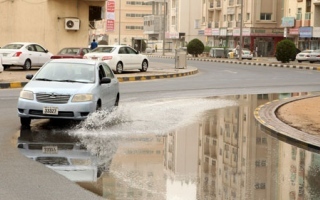 The ban has seemingly been lifted on more than one occasion in the past, with this website reporting in mid-March about Skype’s accessibility in the UAE, when du users were able to use the service. 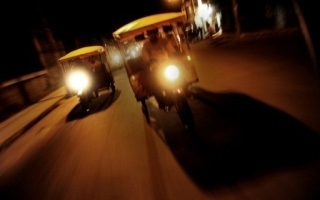 That joy was, however, short-lived when the service was once again barred by the telecom operator’s servers. Is this time for final? Watch this space.